English - Fundación Yepez A.C. The Yepez Foundation is a non-profit organization dedicated to the protection of sea turtles and the environment. 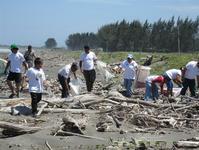 We work in community conservation projects and others like reforestation, beach cleaning, and recycling. We do all this with a special focus on environmental education. Our main priority is the protection and conservation of sea turtles that are currently critically endangered, our main location is the northern area of Veracruz in Mexico. There is perhaps no more global creature than the sea turtle, shared by the seashores of the world. They’re capable of surviving both the land and the ocean since they’re thrust into the world and all its risks. The Yepez Foundation offers you a cordial invitation to be a part of this movement. Meet us, contact us, participate on our projects and let’s embark the adventure of life together.